How thoughtful. The President gave the economy a special gift before jetting off to Hawaii. The Obama administration is cramming like a college student trying to study for a final exam, publishing more than 1,200 new regulations in the last 15 days alone, according to data from Regulations.gov. Energy and environment rules are the biggest category, with 139 published by the federal government in the last 15 days… So far this year, the Obama administration has proposed or finalized more than $200 billion in regulations when the coal ash rule’s costs are factored in, according to the American Action Forum. Unfortunately, it appears there is no return policy for these gifts, even if many of them are actually lumps of coal. So is there a way to quantify the cost of all this regulation, particularly when added to all the red tape that’s already been imposed? The honest answer is that it’s very difficult. Do you measure only direct budgetary costs? What about compliance costs for the private sector. And how about the indirect costs of diminished productivity, not only in terms of economic performance but also the impact on longevity? On the other side of the ledger, should there also be some calculation of benefits? A national 5-MPH speed limit would wreck the economy, to be sure, but it would save lives. How does this get measured, using cost-benefit analysis? The bottom line is that the methodological issues when looking at regulatory burdens are significant, so take any numbers with a few grains of salt. With that caveat out of the way, here are some very large numbers to digest. And now we’re going to augment this disturbing list. The Mercatus Center at George Mason University has a “RegData” page that allows a user to generate all sorts of information on regulatory burdens. But I wasn’t focused on “micro” data on the regulations that affect different industries or the regulations promulgated by various bureaucracies. I clicked on the data designed to capture the overall “macro” magnitude of red tape. And we have two types of information. 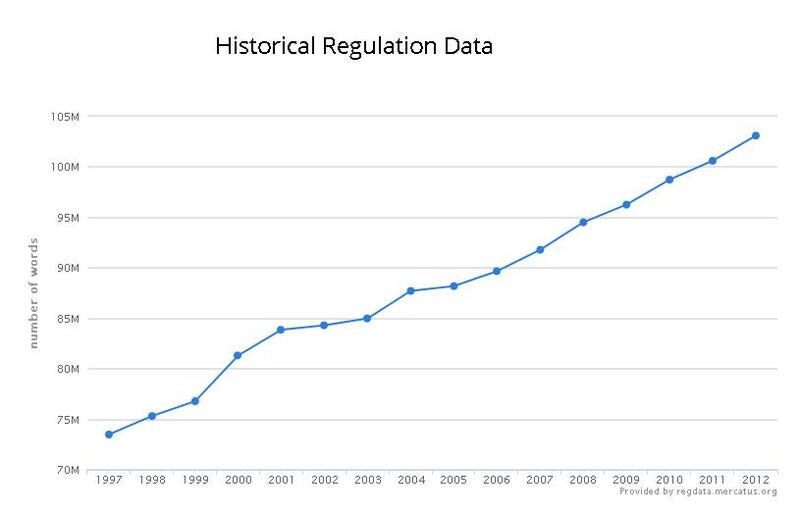 This first chart measures the numbers of words in the annual Code of Federal Regulations (which makes great reading if you’re suffering from insomnia). The bottom line is that there’s been a 40 percent-plus increase in the number of words over the past 15 years. To be sure, the number of words cranked out by regulatory bureaucracies is not a perfect measure of regulatory burdens. The Pentagon, for instance, has 26 pages of regulation detailing how to bake brownies. That’s insanely stupid and probably makes brownie procurement four times more expensive than necessary. But there are regulations with fewer pages (and fewer words) that are far more expensive to the overall economy. The IRS, for instance, imposed a regulation to force American banks to put foreign tax law above U.S. tax law regarding the reporting of bank deposit interest paid to nonresident foreigners with U.S. accounts. That regulation was less than five pages long, but could drive millions of dollars from the American financial system. The good news, if you’re grading on a curve, is that the use of coercive terminology has jumped by “only” 28 percent since 1997. I guess you could say that bureaucrats are becoming loquacious faster than they’re becoming proscriptive. Or if you’re a glass-half-empty person, you could say that they’re making us read more to learn how our freedoms are being curtailed. 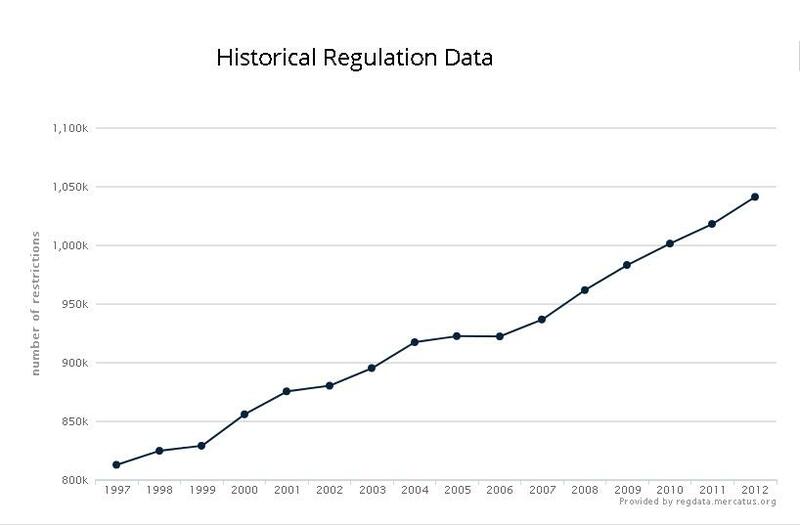 Now let’s look at the regulatory burden imposed by one piece of legislation. I’ve referred to the so-called Wall Street Reform and Consumer Protection Act as the Dodd-Frank Bailout Bill, but that really doesn’t capture the scope of the legislation. Robert Genetski has a column in Investor’s Business Daily that attempts to measure the law’s economic burden. Our politicians have placed any number of barriers in the way of prosperity, and one of the most costly has been the Dodd-Frank financial reforms (DF). …The Government Accountability Office provided an original estimate of Dodd-Frank’s direct cost: $2.9 billion over the first five years. If that is accurate, it means the law will cost the taxpayers roughly $600 million annually, or $5 for each private-sector worker. The direct cost to taxpayers is only the beginning. Historical estimates show private-sector costs to comply with government regulations tend to be 36 times the direct cost to government. If Dodd-Frank is typical, the annual cost of compliance will be more like $22 billion, or $188 for each private-sector worker. Unfortunately, there are numerous indications the Dodd-Frank regulations are far from typical. …Dodd-Frank has a compliance cost of close to $120 billion annually, or just over $1,000 for each private-sector worker. As burdensome as that estimate sounds, it too likely understates Dodd-Frank’s compliance costs. …the Davis Polk law firm identified 398 explicit new regulations created by Dodd-Frank, making it at least 25 times more extensive and complex than Sarbanes-Oxley. If the costs of complying with Sarbanes-Oxley are the more reasonable gauge for those associated with Dodd-Frank, it could easily cost 25 times more than its predecessor, or $225 billion a year. This amounts to almost $2,000 for each private-sector worker. Wow. I’m glad he ran out of space. The burden of the law got more expensive with each new paragraph. Now let’s shift to a more uplifting story. Back in the late 1970s, politicians actually deregulated the air cargo sector. The folks at Mercatus highlight some of the benefits. In the twenty years prior to deregulation, the CAB refused to certify the entry of any new cargo carriers or the expansion of existing ones into new routes and limited the size of plane allowed for air cargo hauls. Thus under this regime carriers such as FedEx, which was classified as an express (rather than cargo) service, could only use small planes even when larger ones were the more efficient choice. …Deregulation of the airline industry occurred in two stages: the first happened with the passage of Public Law 95-163 deregulating interstate air cargo transport in 1977; this was followed a year later by the Airline Deregulation Act of 1978 deregulating the air passenger industry. The effects of deregulation were dramatic. …Absent route restrictions, the air cargo industry began using hub-and-spoke models that made widespread overnight shipping possible. …Free from operational restrictions imposed by the CAB and the Interstate Commerce Commission (ICC), shippers increased reliability and provided a multitude of delivery speed, time, and method combinations. …Deregulation of air cargo was a key element in the emergence of modern supply chain management and allowed wider access to goods supplied by domestic and international sources. It also facilitated American trade to foreign markets. Efficiencies in widespread use of hub-and-spoke models for air cargo, by reducing total costs, enable more American products to reach foreign markets. There’s also an accompanying video that is perfect for the season. If air cargo regulation was the good and Dodd-Frank was the bad, I guess it’s now time for the ugly. Here’s a video from Reason that satirizes the TSA for senseless rules on what can – and cannot – be carried onto a plane. Just in case you think the video is unfair to the TSA, check out these horror stories. P.S. Here’s what would happen if Noah tried to comply with current regulation when building an ark. P.P.S. 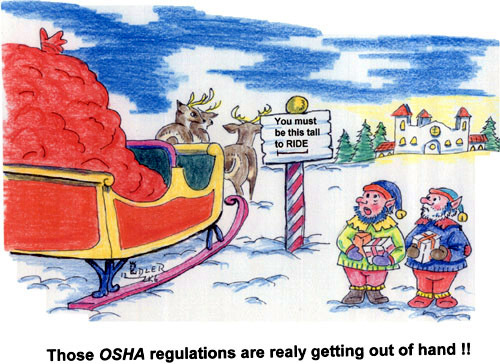 Meanwhile, there are reports that Santa Claus was arrested after a multi-bureaucracy investigation found that he violated a slew of federal rules.